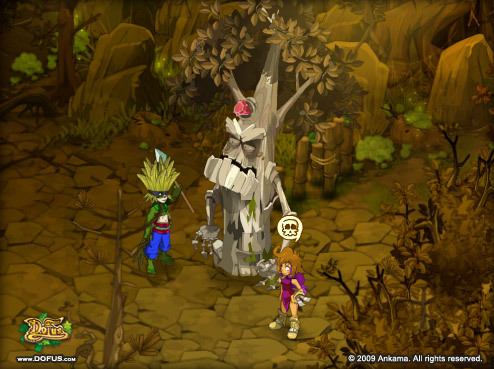 Dofus is a fantasy MMORPG developed by Ankama Games. The game is based from a Flash engine, so the download is fairly small compared to heavier games. This also means that the game’s style is more simplified. However, that does not take away from the world of Dofus, as there are over 4 million accounts created since its launch back in 2005. The game follows a P2P model, while offering limited F2P experiences for those who want to try it before paying for it. 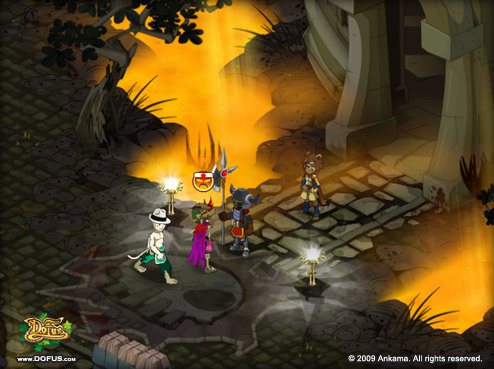 Dofus’ most defining feature would be its distinct turn based combat which is similar to most tactical console games. Despite the limitations, I found playing as a free player for the short time I’ve played this to be quite enjoyable. After a very fast download and installation, I was able to jump into the game world in literally less than 5 minutes. That’s far more then what I can say with most MMO’s I’ve played. I’m a fan of tactic style combat as well, so it turned out to be something unexpected for an MMO. 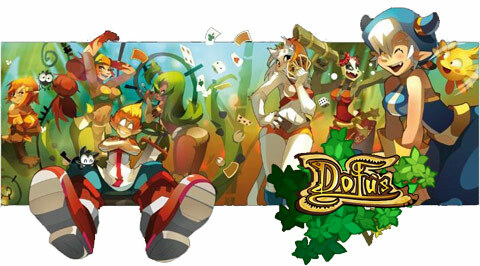 Because of Dofus being developed using a Flash game engine, the size is extremely small. This allows anyone who’s thinking of trying this game out a chance to jump right into the world without the hassle of a long download. The game itself is under 200mb when fully patched, so it won’t use much space on your hard drive either. It can be downloaded on pretty much any PC, so that leaves a lot of possible uses for any system. Upon the start of the creation process, you’re asked to join a classic server by default. There are also other options such as heroic, and tournament. I chose classic since it is the best option for first time players. The character creation is quite impressive for a 2D game. There are twelve total classes to choose from, each represented by its own avatar. 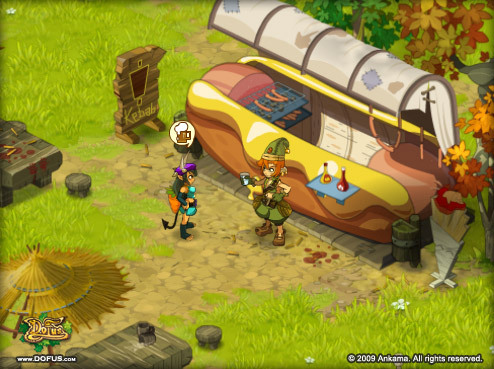 Character creation can be a bit goofy in appearances, but Dofus is an animated theme, so it works well with the theme. You can play as a pixie, cat girl, treefolk, dragonkin, or even a granny, and several other possible odd creatures. Even though they’re oddly named, the game follows the standard MMO class setup (mage, warrior, archer, etc.). Appearance customizing is limited to gender and the color of the character’s clothing and skin, but there are many possible colors that can make your character very different from others. Ever wanted to look like the Hulk, it’s possible in the world of Dofus, or maybe the Hulk with wings! After character creation, you’re taken to a short intro cinematic that explains some of the game’s backstory. Dofus is a term used to describe the six sacred dragon eggs in the world. They were stolen and the incident lead to turmoil across the lands. It’s up to you to find the Dofus and put everything back in order before it’s too late. Players begin their adventure in the floating island of Incanmam, which acts as a tutorial zone for new players. After completion of the tutorial, the players are taken to the mainland, known as the World of Twelve. Because the world isn’t an open world setup, the players must travel between the maps by walking onto circular icons on the ground at the edges of the maps. The icons can be difficult to find at times, since they often blend in very well with the environment they fall on. Combat in Dofus takes place on a separate screen once the target has been walked over by the player. The player chooses where they want to start the fight, choosing the closest distance for a faster ending to the victim creature. The combat is a simple tactic style movement, where you can move up, down, left, or right. You have to walk up terrain as well as around obstacles like any other turn based game. AP is the standard for how many action points you get each turn, which is used up by moving or fighting. All spells have their own unique range, and melee must be done on the tiles beside the target. Ranges takes the safer route since many of the skills can be used out of walking distance of the target, leaving the enemy damaged before it can even come close. There is no specific order to how you move, you can attack then move or move then attack. Although each turn is time limited, there seems to be well more than enough time to complete any actions within the time. This seems slower with the more players participating in the battle. Each turn the players must manually click ‘end turn’ so if any participant is away, the rest are stuck waiting on them to end their turn. Dofus is not like other MMORPG’s that use tactical combat systems, but instead they follow a style similar to console games that use turn based tactical combat. This can create some confusion since other MMO’s that use the turn based gameplay describe their system as tactical as well. Stats are gained after awhile of fighting and the player levelling up. Each level will give the player 5 stat points to align into the stats of the character to further boost its power or survival skills. Each class gets its own skill tree even though some skills are shared. The stats that the points can be distributed to are Strength, Vitality, Wisdom, Intelligence, Chance, and Agility, all of which are common terms for many MMO’s. But if the player needs an explanation of what each does in Dofus, they can simply hover over each stat for a nicely detailed explanation of how it affects their character. This adds some form of customization for the players to make their own unique character despite it looking like many other players. I wasn’t able to go much further than the main city hub of Astrub, which is where you go after the tutorial areas. I did however notice there were player owned buildings that required passcodes to enter, thus proving existence of some form of player housing. Free trial players can’t progress pass this city. The monsters for the trial area don’t exceed level 20, but it still gives a good idea of what to expect in the game. Free levels are capped at 30, and they can’t join or make a guild or participate in the game’s PvP. The free trial is but a very tiny portion of the game, 5% or less. Passed that point, the player must pay the subscription to be able to freely roam the other zones. The monthly subscription is quite low however, so it would easily be affordable for most with a fee of $6.90 with discounts for paying for several months. Dofus is one of those games that can’t be judged by its size. It’s a small game that packs a large punch. The graphics are attractive, and settling, yet remain simple so it’s easy going on any system. With the in depth character development and personal choice for what stats to use, combat can be customized to your desired way of fighting. The tactic combat’s uniqueness has attracted over 4 million players since the game’s release in 2005, which speaks for itself how addicting it can become. The only thing I can see as a con from the little I’ve experienced would be the heavy limitations on free to play content. It leaves a lot to be desired, but it’s still enough to get the idea of how everything will play out. Gamers looking for fast paced combat and movements with modernized graphics will likely be disappointed playing Dofus. But otherwise, Dofus sticks to its promises for those who enjoy the turn based gameplay that many games use.